The New England Patriots seem to always be on the cutting edge of offensive football, but their offense isn’t gimmicky and they don’t call a higher volume of trick plays than other teams in the league. Instead, they use their knowledge of an opponent’s scheme and personnel to find creative ways of attacking weaknesses. When they find a weakness, they’ll attack it mercilessly. Although offensive coordinator Josh McDaniels could reinvent the team from week to week or season to season, one concept that has been a mainstay in the offense is utilizing running backs in the passing game. Every team has pass plays designed for running backs, but no one utilizes these concepts like the Patriots do. The Patriots understand there aren’t enough linebackers who are both stout run defenders and are also good in man coverage. As long as there is a running back on the field, the defense has to be ready for a possible run and has to have at least two linebackers on the field for a majority of snaps. One of those linebackers has to cover the running back. McDaniels loves to test those linebackers by forcing one of them to match up with one of his running backs in space. If the opposing a team has a linebacker that may struggle in man-to-man coverage, the Patriots will find him and put him space. Zach Cunningham was the Houston Texans’ second-round draft pick. He was drafted high because of his ability to sniff the ball out in the run game. Although he is athletic, he struggles with change of direction. McDaniels knew this and isolated him by having running back James White line up out wide in their empty formation. Cunningham has White man-to-man and is aware of his limitations, which is why lines up seven yards off and about two yards inside of White. He doesn’t want to give up the fade or the slant. It is unclear whether White is running an option route, but he runs the perfect route for how Cunningham is lining up. He takes an inside release and then pivots back outside. Quarterback Tom Brady perfectly throws the ball to White’s outside shoulder, which allows him to break a tackle for a good gain. Box defenders aren’t typically used to playing in space, and they really aren’t comfortable dealing with rub concepts, which is why McDaniels will line up his backs in two-receiver sets to run these concepts. White lines up out wide with receiver Brandin Cooks. White then motions inside from a stack formation with Cooks. The defenders have to communicate to avoid getting picked. When the ball is snapped, Cooks runs a wheel route, which forces strong safety Vonn Bell, who is guarding White, to work around the route. Bell has to drive on White running an in-breaking route, and just as he recovers, White breaks back outside and gets wide open. Imagine what this does to Bell’s psyche. His head might still be swimming from trying to defend this concept. The Patriots aren’t always the trend-setters. After getting burned by a running back seam concept against the Kansas City Chiefs in week 1, they stole the concept and used it the following week on the New Orleans Saints. The offense comes out in 21 personnel (2 running backs, 1 tight end, 2 wide receivers). 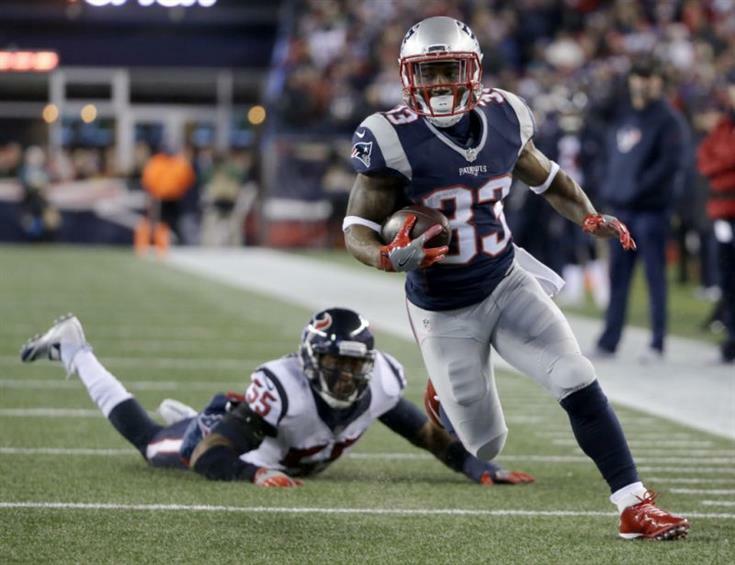 Dion Lewis (No. 33) is lined up in the slot the left of the formation and White is in the backfield. Lewis motions inside and Tom Brady snaps the ball and fakes a fly sweep to him. The play action is enhanced with a pulling guard. White fakes like he is arc blocking outside for the fly sweep, but turns up into the seam for the pass. Linebacker A.J. Klein bites on the run fake, leaving White wide open. The beauty of this play is that the Patriots didn’t run this fly sweep concept to set up the play action. Teams are just weary of the Patriots and their wrinkles. They thought they sniffed out a Patriots trick and had the fly sweep defended, but all of a sudden, they get burned down the middle of the defense. Defenses have several schemes and techniques to contain the impact of wide receivers, but there simply aren’t enough hours of practice to contain the impact of receiving running backs. It isn’t typical to put so much emphasis on throwing to running backs, but the Patriots aren’t a typical team and have preyed off these matchups for years.